Democrats consider the case for impeaching Trump. House and Senate Democrats warm up to the case for Trump’s impeachment. President Donald Trump speaks in the Kennedy Garden of the White House May 1. Not pictured: Democrats in other locations getting excited about impeaching him. One of the hard things about reporting on politics these days—besides the insomnia and constant sense of dread and impotent outrage—is that the news changes faster than you can type. I spent all day Tuesday asking Democrats at the Center for American Progress’ Ideas Conference when they’d be ready to start calling for Donald Trump’s impeachment. As I sat down to start writing, the New York Times revealed that Trump had pressured fired FBI Director James Comey to drop the investigation into Michael Flynn, Trump’s disgraced former national security adviser. Democrats who were reluctant to broach the I-word a few hours ago might now be feeling differently; speaking on CNN this evening, Angus King, the independent senator from Maine, said that if the Times report was true, impeachment would be on the table. Many Americans think it should have been on the table already. 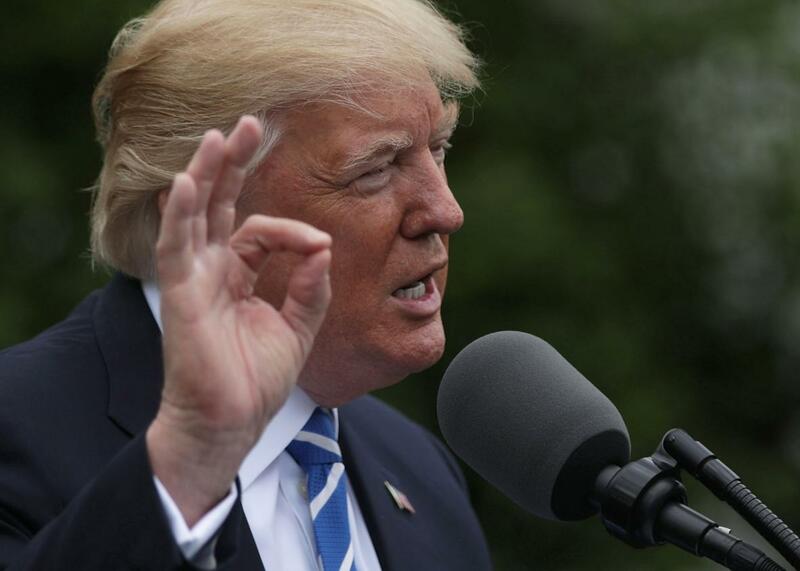 According to a new survey from Public Policy Polling, a plurality of voters—48 percent—want to see Donald Trump impeached. Only 43 percent of voters think he will serve his full term, compared with 45 percent who do not. There is much we don’t know about Trump and Russia, but we do know that he fired the FBI director to quash the investigation, and that he revealed highly classified Israeli intelligence to Russia. If a Democratic president had done these things, there is no question that Republicans would be howling for his or her head. Essentially, Democrats are approaching the Trump implosion like lawyers, not champions of the resistance. Their goal is to see Deputy Attorney General Rod Rosenstein appoint a special prosecutor to investigate the Russia scandal who will assemble the evidence that might, perhaps, at the end of a deliberate process, allow the country to rid itself of Trump. This may well be a sensible approach, particularly since Democrats don’t control any of the levers of power. But it’s a slow one, and it leaves many progressives feeling leaderless, like no one is rising to the occasion of this epic disaster of a presidency. Democrats aren’t willing to go down the path of total obstruction yet, but they’re getting closer. Rosenstein is briefing senators about Comey’s firing on Thursday. If he doesn’t agree to appoint a special prosecutor to investigate the Trump Russia scandal, senators might at last summon the will to grind business to a halt. “I’m prepared to take extraordinary steps, slowing up the processes on the Senate floor, in order to force Republicans to get serious about appointing a special prosecutor,” Murphy said. Given how often Trump has gotten away with transgressing political norms, ignoring the law, and violating minimal standards of human decency, Democratic voters have had to struggle, over the past several months, not to succumb to fatalism. But we may have now finally, finally, reached a tipping point. Before Tuesday evening’s revelations, I asked Merkley whether he thought Trump would serve his full term. “I think the odds are modest at best,” he said. After four months that have felt like four years, it feels like we’ve finally arrived at the beginning of the end.